Porsche CEO Matthias Mueller: "We are analyzing our chances in different segments." Porsche may add an entry-level sports car as part of a plan to double global sales to 200,000 units by 2018. The new four-cylinder sports car would be in addition to a small SUV and a plug-in hybrid supercar recently approved for production. Matthias Mueller, the former Volkswagen executive who took over as Porsche CEO in October, says a new product strategy will be completed by the end of March. The plan will include a boost in production capacity. "We have a good opportunity to get new products to increase volume and revenue," Mueller said this month at the Detroit auto show. "We are analyzing our chances in different segments." 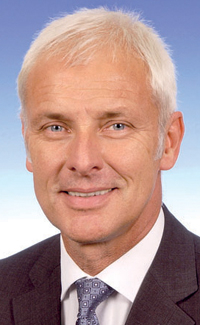 VW Group CEO Martin Winterkorn had previously set a global sales target of 150,000 sales for Porsche by 2018. But Mueller says new vehicles and variants can take Porsche beyond Winterkorn's goal. Porsche says it sold more than 95,000 vehicles last year, but it has not released an official total. Late last year, Porsche approved plans for a small SUV based on the Audi Q5, said Mueller, 57, who was previously VW Group's chief product strategist. Code-named Cajun -- for Cayenne Jr. -- the small SUV is expected in 2013. Mueller, who led product management at Audi for four years through 2007, also wants to add an entry-level sports car similar to the iconic 550 Spyder of the 1950s. It would be priced below the two-seat Boxster. "I imagine having such a car in a few years," he said. "We already have available the technical concept for such a car that is based on the Boxster platform." Porsche could make that car "a little bit cheaper" by using modular systems from the next-generation Volkswagen Golf platform, Mueller said. "That could be a way to have a platform for a smaller sports car," he said. A small Porsche could be produced in one of the automaker's Golf assembly plants, Mueller said. Also, Porsche could develop a four-cylinder engine for the car by adapting its existing six-cylinder boxer engine. A less expensive option would be to adapt an existing VW four-cylinder powerplant. That engine also could be used in the Boxster to lower the car's base price. 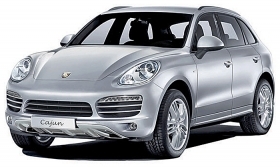 Porsche already shares a six-cylinder engine with VW that is used in the Cayenne. Meanwhile, Mueller said that Porsche's 918 Spyder plug-in hybrid has been approved for limited production but that timing and pricing have not been announced. A concept version of the two-seat supercar with a 500-hp V-8 and three electric motors was shown at last year's Geneva auto show. Porsche also is pondering a targa version of the Cayman, which would have removable roof panels as in the 911. And it is considering other Panamera derivatives in addition to the four-door sedan. Mueller did not give details, but a convertible and coupe have been rumored. Mueller did give more detail on VW's recent decision to entrust Porsche with development of the VW Group's large sedans and sports cars and to put Audi in charge of SUV development. He said the future Bentley Continental and the Lamborghini Estoque four-door sedans would use the Panamera platform. "Concept-wise, the platform fits the best for huge cars," Mueller said. The next Panamera isn't due for five years but "it would be possible to do the platform for other customers in the VW Group earlier, in two to three years," he said. The Lamborghini Estoque, shown in concept form at the Geneva show two years ago, could be the first large car Porsche develops for another VW brand, Mueller said. Audi would continue to develop its large A8 sedan, which has an aluminum spaceframe. But Porsche's new large-car platform could be used if Audi opts to do a larger car, Mueller said. As for SUVs, Audi's modular longitudinal platform will be used for the third-generation Porsche Cayenne, as well as the future Audi Q7 and Volkswagen Touareg. With the expected increase in volume, Mueller said Porsche will need to expand capacity at its Leipzig, Germany, factory, where the Panamera and Cayenne are built. Meanwhile, overflow from its main plant in Zuffenhausen, near Stuttgart, which produces the 911, Boxster and Carrera, could go to a former Karmann factory in Osnabrueck, Germany. In 2009, VW agreed to buy the land, machinery and equipment that was formerly part of Karmann's operations in Osnabrueck following the contract manufacturer's collapse. Volkswagen Osnabrueck was set up in early 2010. The Osnabrueck plant will start building the Golf Cabrio this spring.